The capital of New South Wales and the most populous city in all of Australia, Sydney is an iconic location known and recognized all over the world for its beauty and unique landmarks. Sydney is home to over 5.1 million people in total and stretches out to cover more than 4,700 square miles of land, featuring over 650 suburbs and 15 contiguous regions. Sydney is one of the most visited cities on the planet, boasting key locations like the Sydney Harbour, Sydney Opera House, Royal Botanic Garden, and Sydney Harbour Bridge. The city is also home to more than a million hectares of nature reserves and parks, making it a prime spot for outdoor enthusiasts and nature lovers. If you're planning a trip to Sydney, the best way to get there is to fly into the city's main airport: Sydney Airport. Sydney Airport has the airport code SYD. What is the Sydney Airport Code? The Sydney airport code is SYD, which is used to designate Sydney Airport. 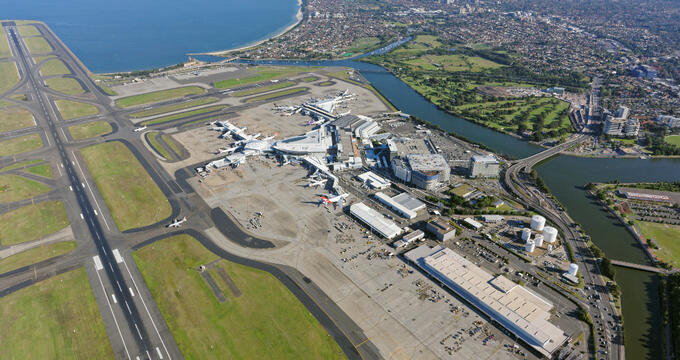 Sydney Airport is also known under several additional names like Kingsford Smith Airport and Mascot Airport. This airport is situated just 5 miles away from Central Sydney, offering very easy access to the city's main touristic and business areas. The address for airport code SYD (Sydney Airport) is The Ulm Building, 1 Link Road, Sydney International Terminal, NSW 2020. If you have any reason to contact this airport, you can call up the following number: +61 2 9667 9111. Sydney Airport, also known officially as Sydney (Kingsford Smith) Airport, has the unique distinction of being one of the oldest continuously operating commercial airports on the planet and has a history dating all the way back to the 1920s. Before the airport was constructed, the land on which it would eventually be built was used as a paddock. Nigel Love, an Australian army pilot, wanted to set up an aircraft manufacturing company in the area and needed to build an aerodrome. He learned of the paddock land and leased some of it, carrying out the first flight on his new stretch of land in 1919. A few years later, the Commonwealth Government came into possession of the land and decided to build on Love's idea, constructed a commercial airport and starting regular flights in 1924. In the years that followed, three runways were constructed and the airport facilities were expanded, with the large international terminal being built in 1966 and opened in 1970, with Queen Elizabeth II herself at the opening ceremony. The airport has undergone several other expansions and developments in the years since then as Sydney has become such an important place for Australia and beloved vacation destination for so many people all over the world. The 'Kingsford Smith' part of the airport's name was chosen in the 1930s in honor of Sir Charles Kingsford Smith, an aviation pioneer. Sydney Airport is the main airport for Sydney and is the busiest airport in all of Australia, with more than 42 million passengers passing through each and every year. This means that SYD is in the top 40 busiest airports on the planet and serves dozens of destinations both domestically and internationally. SYD is a hub for Qantas, Virgin Australia, Jetstar Airways, Tigerair Australia, and Regional Express Airlines, with many other airlines operating at this airport as well. The top domestic destinations to and from SYD are Melbourne, Brisbane, Gold Coast, Adelaide, and Perth. The top international destinations from SYD airport are Auckland, New Zealand; Singapore; Hong Kong; Los Angeles, United States; and Dubai, United Arab Emirates. If you need to park a car at Sydney Airport, there are a few different options to choose from depending on how much you'd like to spend and which terminal you need to use. Terminal 1 is served by a large multi-storey parking garage which provides direct access to the terminal building, as well as a large parking lot just a short walk away from the airport with cheaper daily rates. Terminals 2 and 3, meanwhile, have several parking garages and a 'Blu Emu' area which is the cheapest parking option for SYD airport and involves a shuttle ride over to the terminal buildings. If you're arriving at Sydney Airport and looking for ways to get around the local area, you'll be happy to hear that there are plenty of options to choose from. Sydney Airport is served by two separate train stations: one in the international terminal area and one beneath the car park between the two domestic terminals. Trains leave from these stations on a regular basis all through the day to take passengers quickly over into the heart of Sydney, but it's worth noting that the trains aren't really equipped with big luggage racks, so you might want to choose another option if you're traveling with big bags. Several buses also serve the airport, along with taxis and ride shares. Sydney Airport has one on-site hotel. Rydges Sydney Airport, located at Sydney Airport, 8 Arrival Ct, Mascot NSW 2020, Phone: +61-2-9313 2500) is set inside the international terminal at SYD and provides cozy, comfortable rooms at affordable rates, as well as a bar, fitness center, and restaurant. There are plenty of other good accommodation options right nearby as well, only 5-10 minutes from the terminals by car. A lot of these hotels offer low cost rooms and plenty of amenities including indoor pools, bars, restaurants, gyms, and more. See below for contact info for the best hotels near Sydney Airport.